When it comes to camping and breakfast, there is nothing quite like having breakfast ready when you wake up. 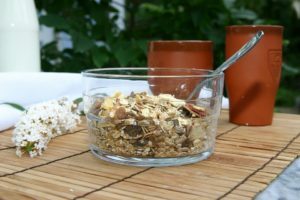 Here are some fun and easy to prepare oatmeal recipes for camping breakfasts. There are two ways to do this. You can prepare breakfast for a large group, or individual breakfasts. Using a dutch oven or any other pan that has a lid, place your oatmeal in the bottom of the container. Grated carrots with honey and brown sugar. Some like raisins in this as well. Blueberries, blueberry jam, honey and lemon rind go well together. Strawberries/oranges or cherries with cocoa powder and shaved chocolate are ideal together use honey to sweeten. Place lid on your container and set in a safe place. In the morning, this will be ready to serve hot or you can warm it gently over the campfire. Have on hand some pint sized glass jars. Be sure that you have the lids. Flavors as mentioned above in each jar. This is ideal as each child can choose his or her favorite. No need to listen to complaints this way. Place lids on jars and set either in the cooler or ice box or you can simply cover them and set them in a safe place. In the morning, this can be eaten cold from the jar or you can place the jars in a pan of simmering water to warm them.